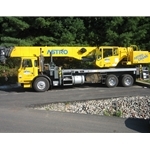 With its compact design, the 40-ton Grove Crane is an ideal solution for maneuvering in tight corners. This Grove crane has a maximum weight capacity of 40 tons and features a main boom (with four sections) extending up to 102 ft. With is slender footprint and small chassis, this crane is easy to transport. It’s outfitted with electric joystick controllers and features an automotive-style control panel. It also boasts a powerful Cummins diesel engine for reliable operation.